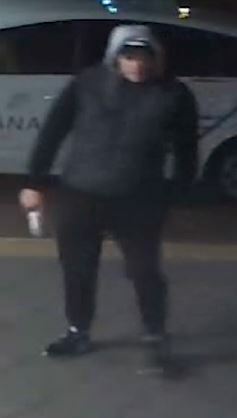 The man Fremantle Detectives want to speak with. FREMANTLE Detectives are searching for both the victim and knife-wielding assailant in an apparent attempted vehicle theft in Willagee on Sunday. Just before 7pm the victim was outside a supermarket on Archibald Street when he was approached by an unknown man who produced a knife and demanded the victim’s car keys. The victim backed away from the man, who kicked out at him, causing him to fall to the ground. While on the ground the assailant held the knife to the victim’s face and again attempted to take his car keys. A bystander observing the incident grabbed a pole and approached the offender, who turned around and walked towards the bystander while brandishing the knife. The bystander then retreated and the assailant walked away in an easterly direction, last seen at a nearby park area on Worsley Street heading towards Leach Highway. The assailant is described as being fair skinned, 25-30 years old, about 190cm tall with a slim build. He was wearing a blue hoodie with a grey hood and sleeves, and blue jeans. At this stage it has not been established who the victim in the incident is. Detectives want to speak to anyone who may have information, in particular the victim.